← President Donald Trump WILL likely face future ‘Impeachment’ – but will he last that long though? Casualty Number 8 of Trump’s maverick ire, has just been revealed and it was his brand-new and third communications director in six months, Anthony Scaramucci. It is beyond a joke and beggars belief, doesn’t it? The guy lasted a mere 10 days – oh yes, it’s tough at the top, isn’t it? The White House is increasingly without stability and is embroiled in disorder with constant shakeups and turmoil, which is fuelled by Trump himself, isn’t it? Other significant news is that Trump himself wilfully stepped-in, overriding strategy advisors, to personally dictated his son’s initial, misleading statement about the meeting Donald Trump Jr., Jared Kushner and Paul Manafort, had with a Russian lawyer [it falsely claimed that the meeting had “primarily discussed a program about the adoption of Russian children”]. This could put the President’s name in the frame for direct involvement in the affair, leaving him vulnerable to allegations of a cover-up, doesn’t it? 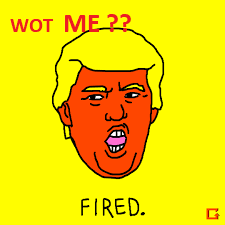 Many of his advisors fear that Trump’s naïve arrogance in increasingly convincing himself that he doesn’t need the help of hired professional lawyers, strategists or publicists, because he sees everything as a simple political problem he can solve himself, without even ever recognising the existence of any legal jeopardy, could bring him down – so that could turn out to be his Achilles heel, wouldn’t you say? This entry was posted in America, communications, community, Elections, government, men, Muslim, newspaper, Other Countries, personalities, political parties, Politics, Press, russia, USA and tagged 'Executive orders', Acting Attorney General, Adolf Hitler (Germany), Allan Lichtman, Andrew McCabe, Attorney General, Augusto Pinochet (Chile), Benito Mussolini (Italy), Chiang Kai-shek (China & later Taiwan), Chris Christie, Congress, Corey Lewandowski, democracy, Democrats, dictator, Donald Trump, Eva Peron (Argentina), Fidel Castro (Cuba), Francisco Franco (Spain), Hillary Clinton, impeachment’, James Comey, Juan Peron (Argentina), Julius Caesar (Rome), Michael Flynn, President Nixon, Presidentof United States, Republican Party, Robert Mueller, Rod Rosenstein, Sally Yates, Sean Spicer, THE CASE FOR IMPEACHMENT’, tyrants. Bookmark the permalink.